JAMMU: INDIAN Army on Tuesday destroyed seven Pakistani military posts across the Line of Control in retaliation to the continued ceasefire violations by them for the fifth day, said officials. This inflicted several casualties also on Pakistani troops, they added. Seven Pakistani posts across the LoC in Rakhchakri and Rawalkot forward areas of Pakistan Occupied Kashmir (PoK) were destroyed, they said, adding there have been several causalities also on the Pakistani side. Three Indian villagers too were injured at Shahpur border area in Poonch district on Tuesday in the shelling by the Pakistani Army, the officials added. Pakistan’s Inter-Services Public Relations admitted three casualties among their troops at Rakhchakri in Rawalakot of the Pakistan-occupied Kashmir. An Indian Defence spokesperson said the Pakistani Army began violating ceasefire early on Tuesday. The spokesperson said the Pakistani troops violated the ceasefire at 11.30 am with mortar and artillery shelling and firings by small arms along the LoC in Nowshera sector in Rajouri district. This violation was replied befittingly, he added. “At about 1700 hours Tuesday, the Pakistani Army again initiated unprovoked shelling with mortars and firing of small arms along the LoC in Shahpur & Kerni sectors in Poonch district,” said the Defence spokesperson. “The Indian Army too is retaliating befittingly,” he said. Pakistan’s ISPR too, in a release, said three of their soldiers were killed in Rakhchakri in Rawalakot Tuesday in retaliation by Indian forces along the Line of Control. The ISPR added one of their soldiers too was injured in the retaliation by Indian Army. 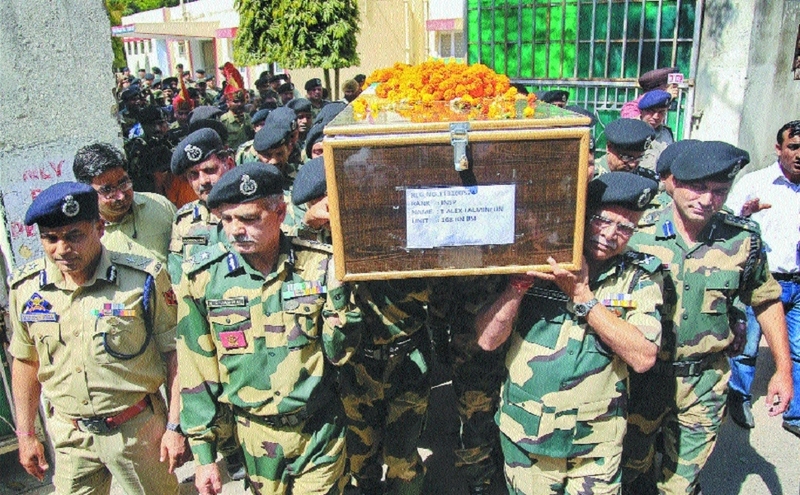 A BSF inspector and a five-year-old girl were among three persons killed while 24 others were injured on Monday as Pakistani troops heavily shelled forward areas along the Line of Control in Poonch district, prompting the Indian Army to retaliate “befittingly”, said officials. As a precautionary measure, all schools along the Line of Control in Poonch and Rajouri districts have been closed by authorities in view of the Pakistani shelling.